Alan Wolstencroft from Banbury has been making a huge difference through his charity to a school in Sierra Leone. Recently, he has helped to fund delivery of more than 1,300 textbooks to the school. It has taken one man’s commitment and passion over the past decade to transform the lives of thousands of children in Africa. 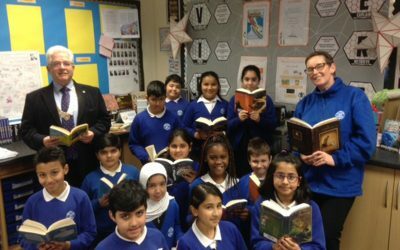 Alan Wolstencroft’s charity has recently funded more than 1,300 textbooks to a school in Sierra Leone which has been the focal point of his fundraising efforts. The books will fill a new library which has been built at the Liverpool Community School in the Waterloo district of the nation’s capital, Freetown. And now the target is to provide science equipment and laptop computers for a new laboratory which has been completed, where electricity has recently been installed. 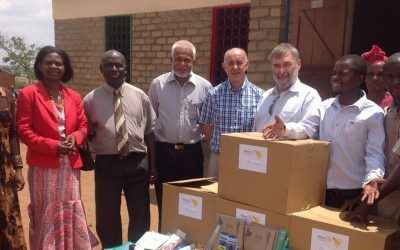 Alan’s Africa is a project which is backed by his Rotary club in Banbury in Oxfordshire, which has been strong financial supporters of the initiative. Alan has also generated considerable funding through a network of supporters raising £225,600 since 2007. “I joined Rotary Banbury in 2004 and the following year I visited Sierra Leone in 2005 as part of a Rotary Mission Challenge team working with Mercy Ships to build the Hostel of Hope at the Aberdeen West Africa Fistula Clinic,” recalled Alan. Since 2007, Alan has worked with a number of schools in Sierra Leone, providing tens of thousands of pounds worth of school equipment and uniform. The link with the Liverpool Community School was forged in 2013 with the junior and secondary schools catering for 700 children spread over two separate sites. “The majority of the classrooms were constructed of a combination of tarpaulins, timbers, matting and corrugated tin,” recalled Alan. “At the secondary school, space was at a premium so they operated a two-shift system with the junior secondary students attending school in the morning and the seniors in the afternoon. “There were no toilets at either of the school sites. “I pledged to help the school and in January 2014, on my next visit, after a fund-raising campaign in the UK, we began a building programme to merge the two schools on to one site. “Initially we built and equipped four classrooms, which took 12 weeks to complete. Last year, Alan’s charity committed to build and equip a laboratory and library for the secondary school, a library room for the junior school and install mains electricity to these new buildings, six of the general classrooms, as well as some key areas of the school compound. Progress has been made, with most of these targets now ticked off. 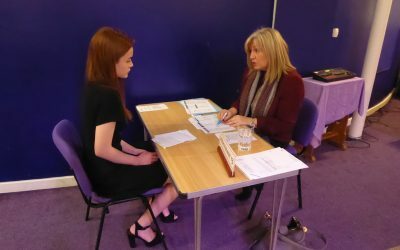 The school has over 1,100 children who all pay nominal fees to attend, which funds the staff salaries and day-to-day running costs. The school receives no government funding and it has never been able to afford the luxury of buying textbooks. That issue has now been addressed with the 1,300 books bought from a local supplier which are suitable for the national curriculum in Sierra Leone. Another initiative launched at the school last April is the ‘Sunny Girl’ project which provides secondary-age girls with sanitary pads. “We are currently supporting 260 girls,” added Alan. Make a real difference in communities at home and abroad!